I use a bullet journal to track habits and map tasks, and since the beginning of the year I have been keeping track of my energy/mood each day. Basically it’s a beautifully simple way of creating a visual of how you felt throughout the year, a means by which to witness our patterns and move towards joy. I was inspired to set up a ‘year in pixels’ that not only gave me an overview of my mood/energy, but connected it to the lunar cycle, so I could see if and how the Moon’s journey through the zodiac affects me month by month. So, another name for it could be your ‘lunar year in pixels‘! If the Moon can create waves in the ocean, it stands to reason it affects us too, eh! 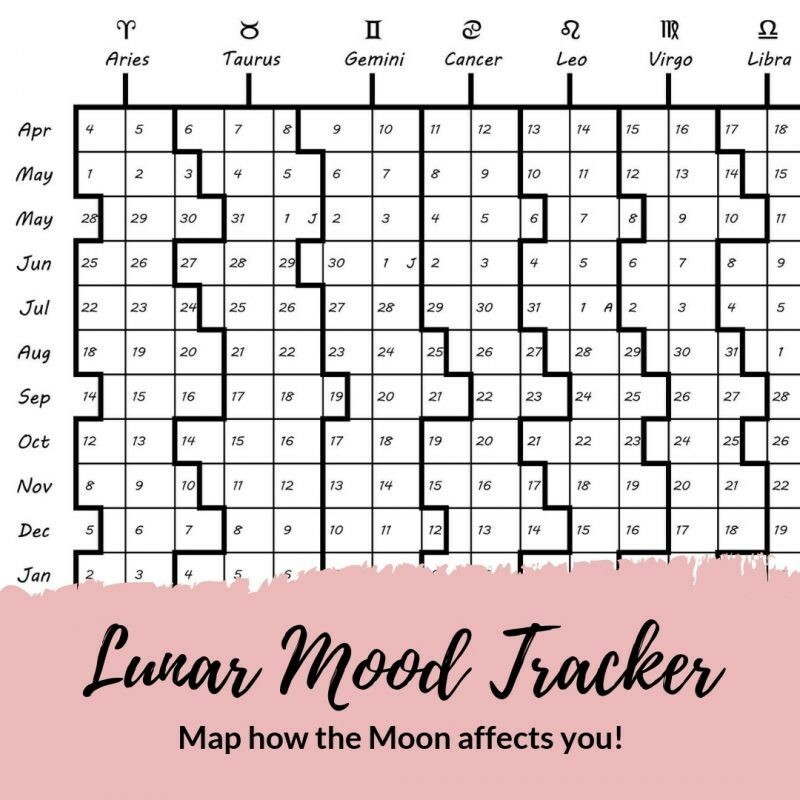 You can use this chart to track your feelings, energy levels, mental terrain, triggers, cravings or addictions, sexual play and more! This is my favourite kind of astrology ~ where we get to roadtest it in our own lives and build our own embodied meanings and connections! Print off the applicable page for your continent/timezone. Five descriptors is good, ten is a lot. Obviously you can have as many descriptors as you like but the power of less is that the patterns can be seen more clearly over time. Google ‘year in pixels’ for ideas if you need. Grab some pencils/markers and create your own key by colour-coding your mood words. Colour in today’s square (or yesterday’s)! Some months are duplicated in the list on the left...?